Looking for a new book to read? Try one of the 2015 Newbery honorees. 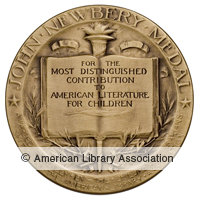 The Newbery Medal is awarded annually by the Association for Library Service to Children to the author of the most distinguished contribution to American literature for children. The association also chooses two finalists. Twelve-year-old narrator Josh Bell uses the rhythms of a poetry jam to emulate the “moving & grooving/popping and rocking” of life on the basketball court with his twin brother, J.B. This powerful novel in verse paints an authentic portrait of a closely-knit family on the brink of crisis. Swish! This book is nothing but net! Jacqueline Woodson’s lyrical memoir chronicles the incidents and emotions she experienced as an African-American girl growing up in the 1960s and 1970s. Precise language magnifies moments and connects them to the larger historical narrative. Her elegant and evocative standalone poems weave a story about her development from a struggling reader and dreamer into a confident young woman and writer. This entry was posted in News & Reviews and tagged homepage, Slider on February 26, 2015 by Clay Swartz.